Looking for natural anxiety remedies? You’ve come to the right place. Let me start by saying that as bad as my anxiety was, I did not want to start down the path to prescription drugs. In general, drugs affect me much more than most people for whatever reason. Usually, any negative side effects far outweigh any short term benefits. I am not a doctor and do not play one on TV. Be sure to talk to your own doctor before taking any anxiety remedy, whether natural or not. Anything I mention here is just for informational purposes, not a specific endorsement or recommendation. When my anxiety was at it’s worst, I remember being in the middle of a 2-3 week period where I was getting at most 3 hours of sleep a night and it was not all at one time. As a result, my symptoms were at their worst. Some people can function on limited sleep, I am NOT one of those people. Avoid all caffeine – Seems obvious, but with so many folks used to their morning boost, this is still one worth mentioning. Avoid alcohol – Alcohol disrupts normal sleeping patterns and just exacerbates the problem. Drink lots of water – The more hydrated, the better. However, stop a few hours before bed to avoid frequent trips to the bathroom. For snacks, eat apples – Many times when my anxiety flared up, I would lose my appetite, but I still enjoyed apples. Avoid laptops, cell phones and anything mentally stimulating up to 2 hours before bed, read instead. Listen to relaxation audio while in bed, this is one of my favorites! This post contains affiliate links. If you decide to make a purchase, I may receive a small commission at no additional cost to you. Thank you for your support in this way. If you’ve tried all of those suggestions and still no luck, one commonly recommended herbal remedy is Chamomile. It is very inexpensive and it is typically used in herbal teas, but that link is to the capsule version. It has several 5 star reviews on Amazon saying that it works wonders for anxiety induced sleep deprivation. Seredyn was one product that I found through some online research. The company claims Seredyn relieves anxiety, insomnia and panic attacks. They also claim that 93% of anxiety sufferers reported relief from feelings of a specific negative emotion. It takes effect in under 30 minutes for the vast majority of people. It wasn’t something I planned to take for an extended period of time, but I needed something to break the every day cycle that I couldn’t break otherwise. When my anxiety was bad, I could not break the constant cycle on my own, so I placed an order. I received Seredyn 2 days later and immediately gave it a try. The dosage states you can take up to 3 at a time when you experience anxiety or panic attacks, max 6 per day. Due to the way medications effect me more than most people, I decided 1 was good. Within a matter of 15 minutes I started to experience a difference. I remember it vividly, because it was the first ray of hope I had in a while. It gave me a very mellow kind of feeling. It wasn’t like I was all of a sudden cured of my anxiety from taking 1 supplement, but it was enough to distract me and change my outlook. For the first few days, I took 1 pill each day when things were at their worst. I think the most I took were 2 pills per day for 3-4 days and then just 1 after that. I have seen reviews from some that say it doesn’t work for them, so your mileage may vary. 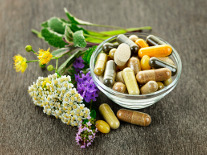 It all depends on how your body reacts to certain herbal supplements. I could definitely notice a positive change in mood and overall outlook. Since overcoming anxiety is all about breaking that routine and resetting your heightened level of anxiety, I feel that Seredyn was a big help for me. Thanks and best wishes for continued success at eliminating your anxiety!